Funny, witty, humorous and sometimes naughty, Woof! 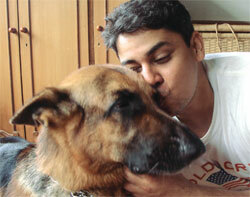 Cyrus Broacha is everybody’s sweetheart. 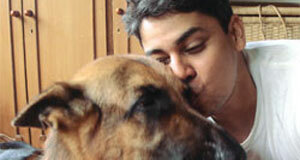 We loved him as MTV VJ, show comperer, entertainer…and D&P loves him as a responsible pet parent. All tails up for this man, whose unmatched compassion for our furry-friends has no scope for lighter notes. D&P in conversation with Cyrus brings forth his new avatar for our readers. Cyrus’s association with acting was started at a tender age of 12 with a Bollywood flick – Jalwa. In this movie, he shared screen presence with Pankaj Parashar and Naseeruddin Shah. He then did his first professional play Brighton Beach Memoirs under the baton of Pearl Padamsee. And with MTV Bakra, he became gen Z favourite. Last year, he entertained viewers with his unique dancing style on Sony Entertainment Television’s hit show Jhalak Dikhhla Jaa. Currently, he anchors a news satire show, ‘The Week That Wasn’t’ on CNN IBN, besides several other regular appearances on small screen.He was MTV International ambassador for AIDS Awareness and has also moderated The Youth Conferences with UNAIDS in Hanover. Well! That’s the known part of his personality; bow! Now we bring Cyrus – The Pooches’ Pal. Cyrus thinks he is a born animal lover. “In 1979, there was one person in our locality, who used to do chemical testing on animals. After performing tests on the puppies, he would dump them. I was a young chap with strong conviction, so I brought them home and took good care of them,” Cyrus fondly remembers this as one of his early missions for animal love. Well…coming to pets, he’s having pets since the age of seven, “My first pet dog – Figaro (Beagle) was more like a cat. He had a lot of attitude, would not listen to anyone and had loads of tantrums. This was all indoor story…once we went out and left him off the leash, he was an adorable child. After him, came Don Govannio and Volpy. All of them were different in their own way. Fiagaro was individualistic, Don Govannio was attached to my dad and I and Volpy were best buddies. Volpy was with us at the time, when I was an enthusiastic teenager, we both had a wonderful time together,” he recalls. Broacha’s household is today filled with the antics of young Ruffo – GSD, he is a true sweetheart. And Ruffo’s protected kid is Maya, Cyrus’s one-year-old daughter. “It’s great fun to watch them together. They are so comfortable together, my daughter has all the smiles for Ruffo…they get along very well,” he adds. And Mikhaail – his son, just adores his big brother as well. If he’s Cyrus’s dog…then its obvious to ask about the funny side of Ruffo’s personality…“Oh! He is a real gentleman…with a few goof ups. Lemme share one. Ruffo has free access to every corner of our home. Once a female guest was having a shower and Ruffo just barged into the bathroom, she rushed out screaming and li’l Ruffo was wondering, what went wrong…or he’s an over smart pooch,” he divulges. And his dad’s wish to be reborn as one of the Broacha’s pets is quite touching…and he feels this is actually a testimony of unconditional love and care, they all give to their pets. On a concluding note, Cyrus appeals to all pet parents to treat animals better, “They are God’s gift to us. If we have one, it should be our responsibility to look after his needs like food, exercise, walks, medicine etc. We shouldn’t shoulder all responsibilities to the house help, we need to give them time.” He also feels that government should impose penalty on those, who ill treat their pets. Well! That’s ike a true pooch lover… Kudos to Cyrus!